New AHA Standards are coming in 2019 and we have what you need. The American Heart Association (AHA) has announced that by 2019 all CPR training will require the student to perform CPR with a feedback device. What does this mean you may ask? This means when you take a CPR class, and when you have to perform compressions on the manikin, the manikin will have a device built in it to let you know that you are compressing hard enough. These feedback compression devices will either be a clicker built in the manikin or light that shows you are doing the compressions correctly. Some companies may have a video game system that gives you direct feedback and may bring in a little competition among students. We will be talking about the different devices you may come across when taking a CPR class in the future. The new and most popular training manikin you may encounter is the Preston manikin. These units are lightweight body torso with an led light on their left shoulder. How it works is that when a person compresses on the chest at a depth of 2 inches, a light will come on. The first indicator light is Red which usually we consider dead. The second light which states you are too slow and not deep enough is yellow, that means you are too mellow. The goal with this manikin is to reach two green lights which state you are deep enough and fast enough, but be careful not to go too fast or you will get a blinking yellow light, which means caution. There is another module aid that we like to use, and it is called Loop CPR unit. 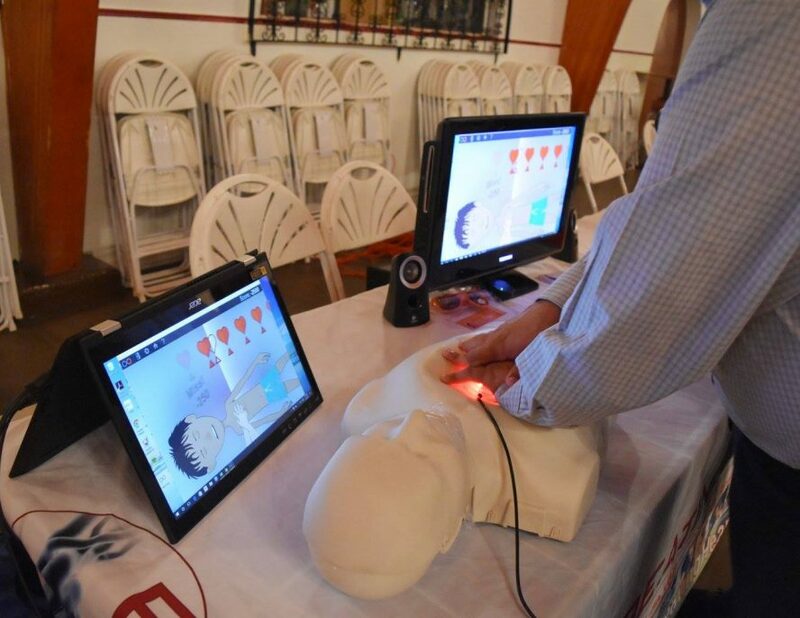 This is a video game system that allows users to interact as they are performing CPR on the manikin. The screen has an avatar that shows hands on its chest to monitor how you compress doing CPR with beat music in the background. The machine scores you on how your compressions are and lets you know if you are doing it correctly or not. The Loop system helps with muscle memory and can allow some friendly competition in the class. If you are trying to set up your own training center or providing your classes and need some of the proper AHA equipment you can let us know by clicking on the subscribe button on our website or browse through the Beating Heart Center online store.